Hello everyone, welcome to Part 2 of my Christmas home tour today! 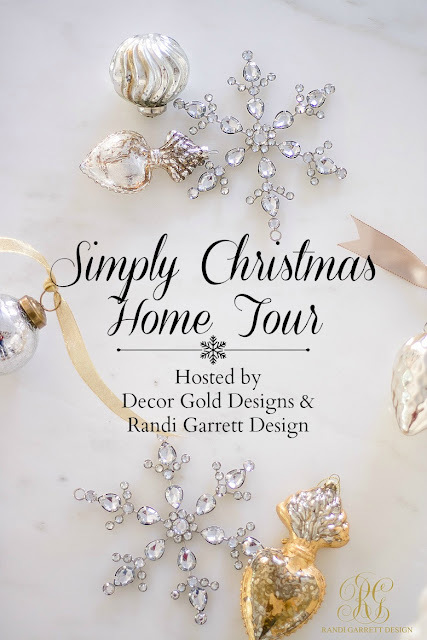 I'm so happy to be sharing my Entry and Dining Room with you as a part of the Simply Christmas Home tour, hosted by the lovely Randi of Randi Garrett Design and Jennifer of Decor Gold Designs. If you've found your way here via Life on Virginia Street, nice to meet you! Sarah is such a sweet heart and I always enjoy her beautiful tours. 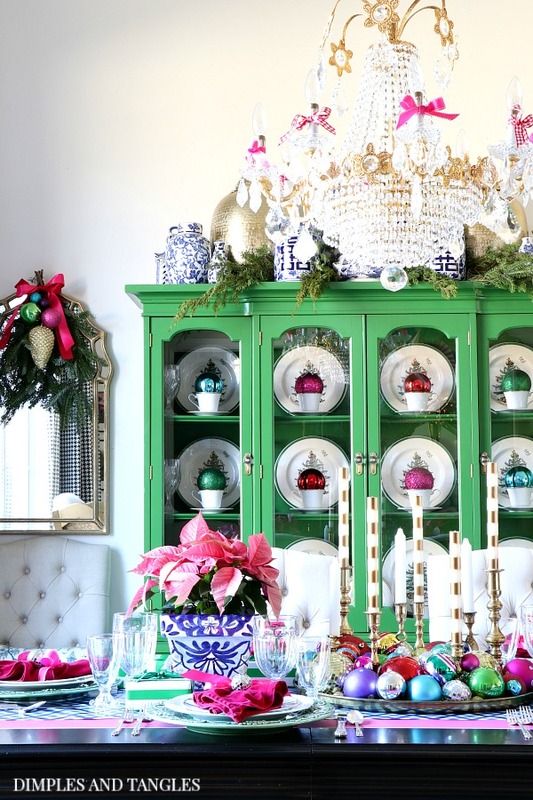 I'm loving her pops of Emerald Green in today's tour, and every time I see her "O Holy Night" canvas I'm determined to find a spot to add one of my own! 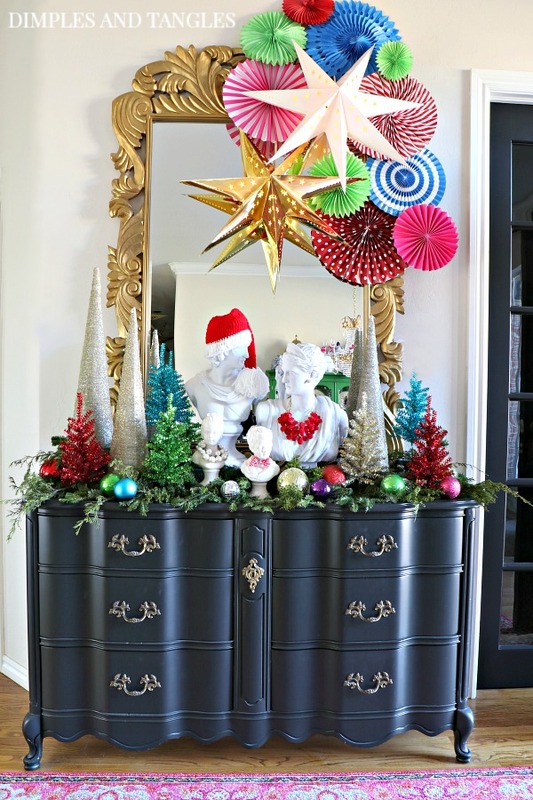 I've had so much fun injecting bursts of Christmas color into every nook and cranny... come on in and take a peek! 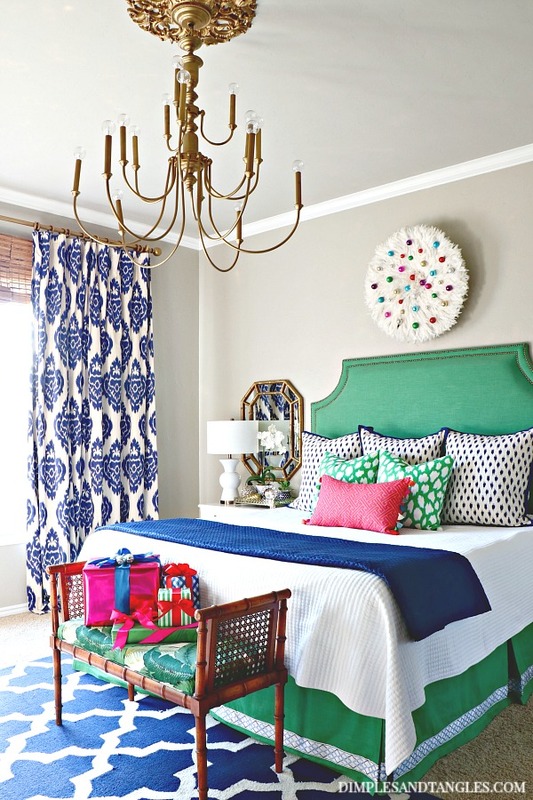 If you're new here today, my style is fairly traditional, but I love to use bold colors and mix and match patterns. I have no idea what to label my "style," if I like something I add it in! I also enjoy keeping an eye out for second hand pieces that might work in my home. I appreciate the quality that older pieces bring, the collected feel of different pieces, and generally the bargain price that comes along with them! 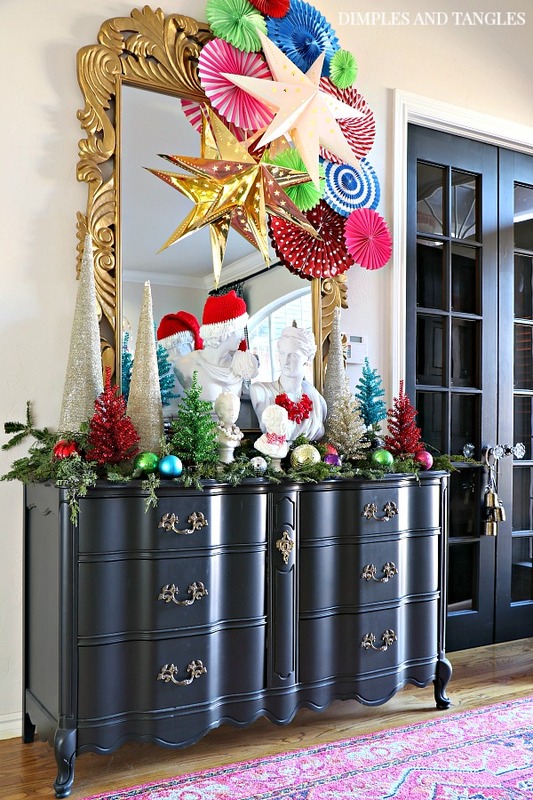 My Entry houses an old dresser that I painted and a large mirror scored from Craigslist. This space usually changes season by season and it's a fun spot to change things up. *Affiliate links may be used at no extra cost to you. Read our full disclosure policy here. 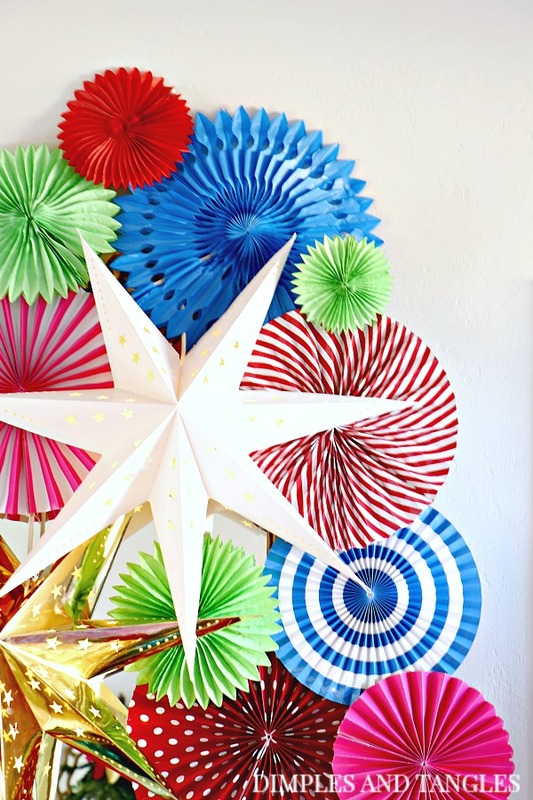 I love adding these paper fans and 3D stars into my Christmas decor. The cords of the stars drape over the top of the mirror and hang down the back, and the fans are attached with rolled pieces of masking tape. They're light so it doesn't take much to secure them. After the season I carefully remove the tape, fold the fans back up, and they're easy to store! Our Dining Room is directly off of the Entry. It too is made up of a mix of new and second hand pieces. 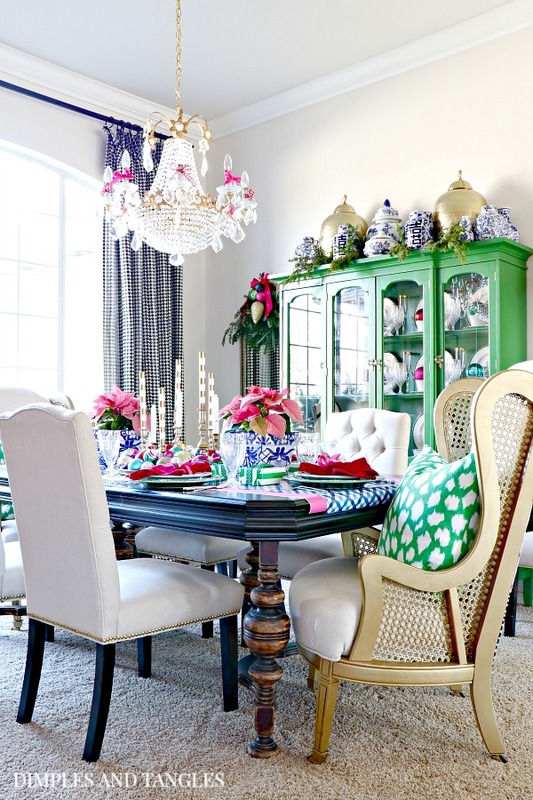 I can't believe it's been almost 5 years since I added the green china cabinet, it has been one of my most beloved makeovers! 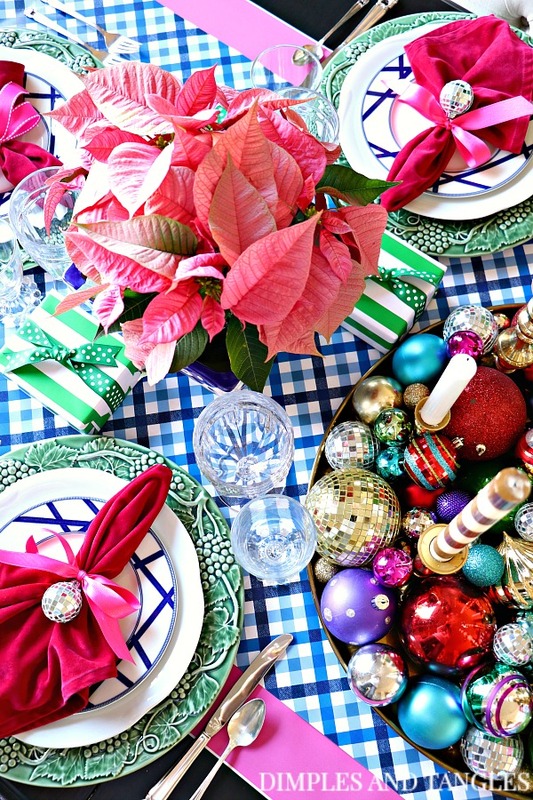 Honestly, I had planned to just do the tray with ornaments as a centerpiece in this room, but before I knew it I was putting together a full blown tablescape to go with it. As always, I got creative and used what I already had, with the exception of the pretty pink poinsettias that I picked up at Walmart. 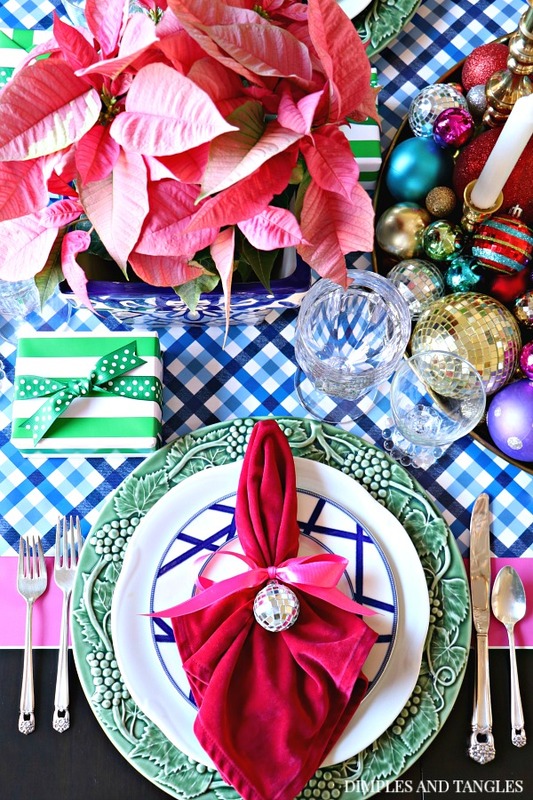 I tend to use strips of fabric as table runners, but didn't have anything on hand in the color that I was wanting to use for this table, so I rolled out some strips of wrapping paper. Perfect! The variety of options is endless and it provides easy clean up after the meal. 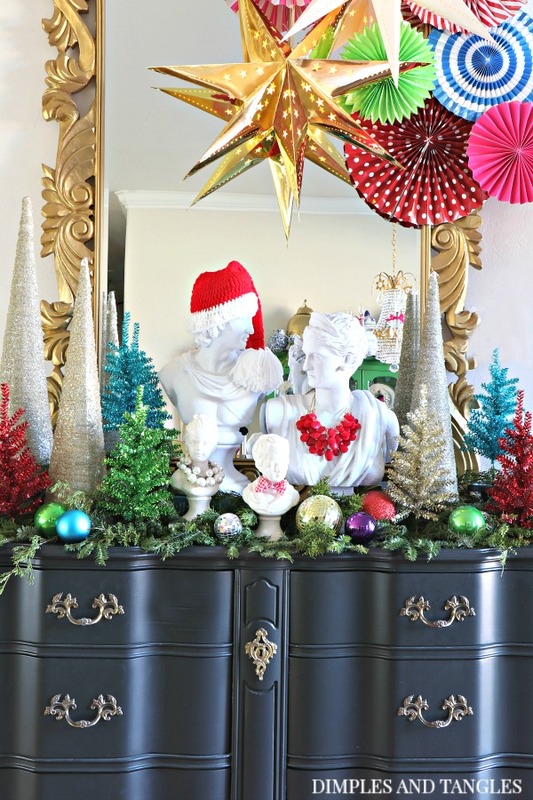 Similar to the centerpiece I used in my Breakfast Nook last Christmas, I loaded up all of my extra ornaments on a large brass tray. Most of them are inexpensive shatterproof ornaments, but there are a few vintage ones mixed in that I've picked up at yard sales. 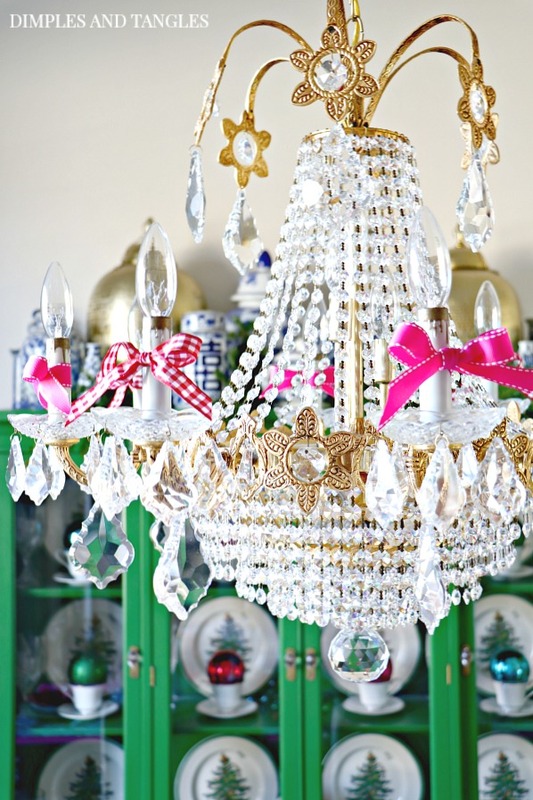 This chandelier was another Craigslist purchase that came from a home that was being gutted. I added many of chunky crystals and love it's unique style. We are excited to fill this space with lots of family and friends in the weeks ahead as we prepare to celebrate our Savior's birth! 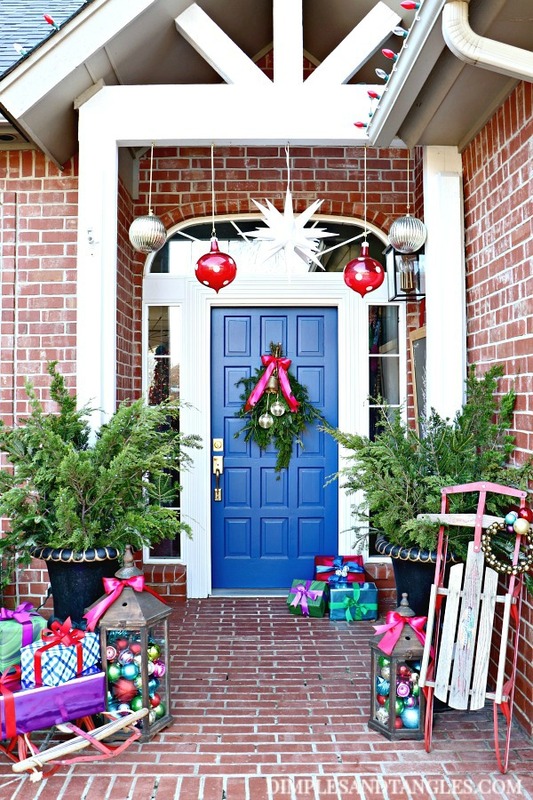 If you'd enjoyed today's tour, make sure to take a peek of Part 1 of my Christmas tour too where I shared my front porch and living room. If this is your first stop on the tour loop today, next go to Randi Garret Design. Every time I look at Randi's home I feel like it's straight out of the pages of a fancy magazine. But actually, she's one crazy talented designer and Mom- five children and her husband live here with her! 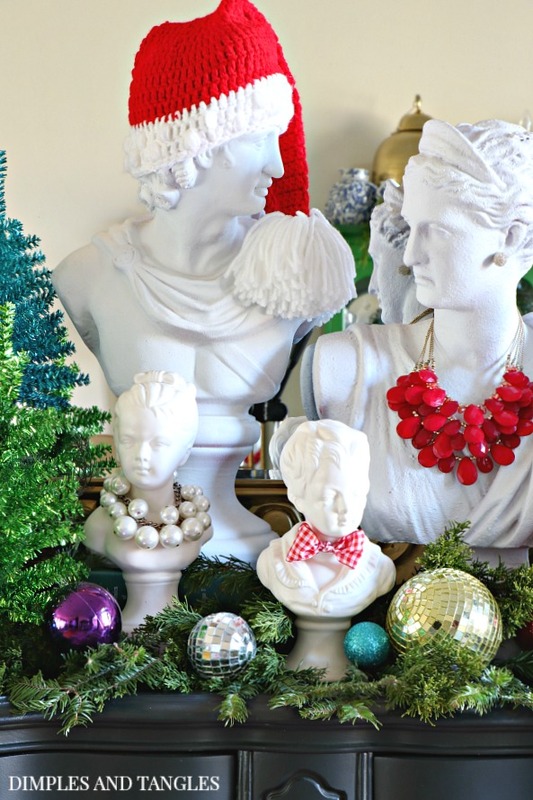 Make sure to visit these other blogs today as well, I promise you'll find load of festive photos and more inspiration than you can wrap your mind around! as i said the other day, no one does color like you! your entry is SO fun! OMG I can't even deal right now. Most beautiful thing ever. All of it! I love the bright colors! I absolutely love all the vibrant, happy colors! 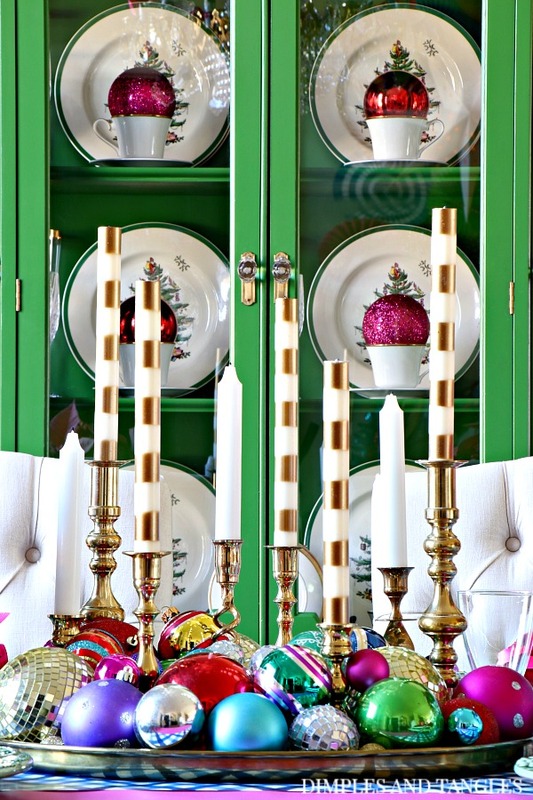 I also adore what you did in the china cabinet with the ornament in the cup in front of the plates. Such a simple yet beautiful idea! Love it all! Looking at your home is something that makes puts me in a good mood! Love all of your ideas. The glass dish with the retro lights is just so clever! You have a beautiful happy Christmas house. 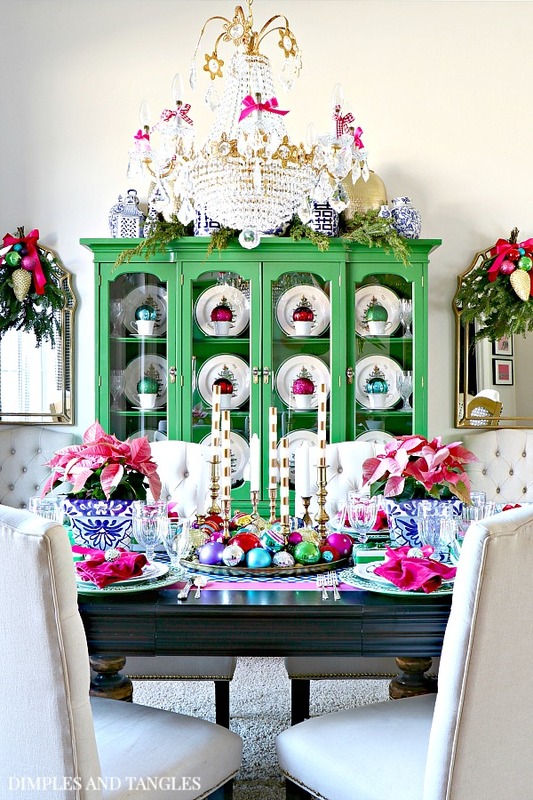 I have loved your green china cabinet since the first time I saw it several years ago. Hi Donna, here's a link for you. The lamps are wonderful! You are the best!! Thanks so much!! Just smashing! I love the pink poinsettias too this year Jennifer! 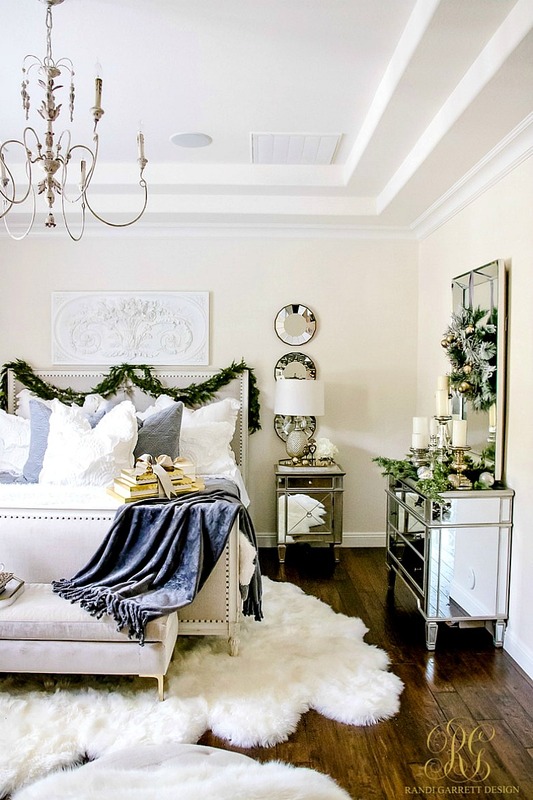 Love, love, love your BHG feature! So happy for you, congrats! 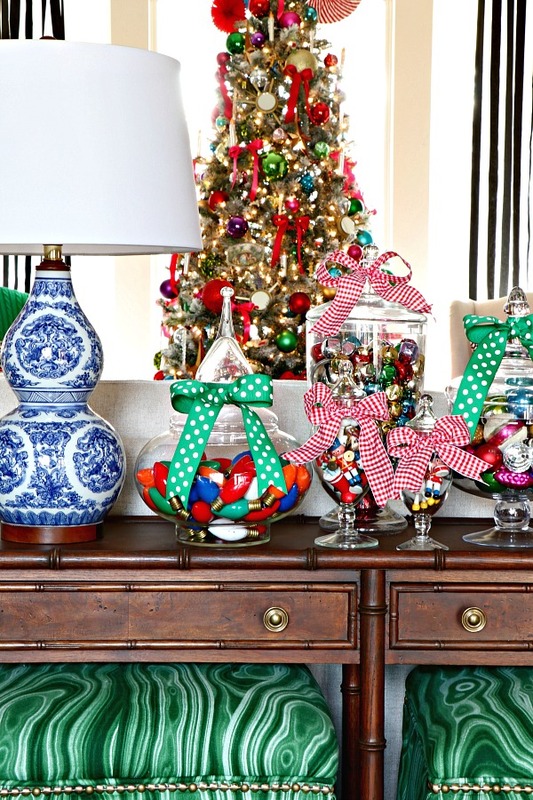 The most cheerful home, any season of the year! 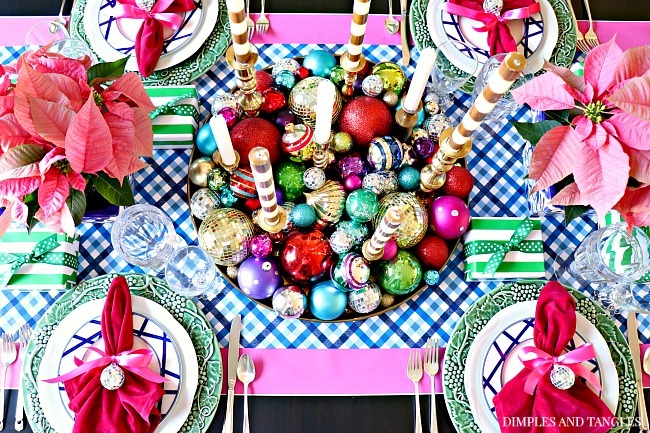 Love it all, especially the tray with candles and ornaments on the table! I hate when the centerpiece has to be moved for everyone to see each other, and that looks like it could stay and not be in the way. Your bold use of color is always such fun!